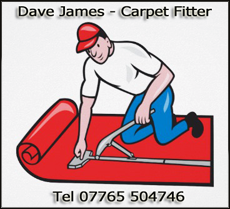 Dave James Carpet Fitting Service. New carpets and vinyls supplied and fitted, with over 30 years experience! For a FREE no obligation estimate call Dave now for an immediate quote.